Hollis Molloy of CrossFit Santa Cruz remembers the good old CrossFit days, the days when CrossFit Founder and CEO Greg Glassman hosted every single Level 1 Seminar, when the entire group—including Glassman—went for pizza and beer after the course. Molloy, who started CrossFit at Glassman’s original CrossFit gym, was around in the days when the CrossFit Games were just a gathering of friends who liked working out and hanging out together in Dave Castro’s parents’ backyard. 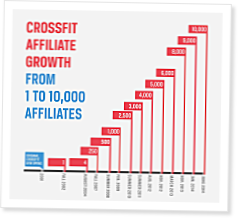 He was around when nobody had heard of CrossFit, when there were only a handful of CrossFit affiliates in the world—each of them eager to spread Glassman’s definition of fitness. Glassman’s original gym, opened in 2001 at 2851 Research Park Drive in Santa Cruz, California, grew into 10,000 affiliates around the world, and part of the reason is that the message from the good old days is still intact today. This fact, at least partially, has to do with the affiliates themselves. One of the rare beauties of being in a CrossFit gym is that it doesn’t usually feel as if a business is operating around you. Instead, you can feel the pervasive community, the family that lives inside each box. That’s as true with 10,000 affiliates as it was when there were two. I can remember becoming one of the first 500; I think I was three-hundred and something. That was in early 2008. Crazy to think that 6 years later we have added another 9500. Congratulations to every single on of them. I remember when it was in the teens. The chart thing at the end is really cool. Makes me feel nostalgic.